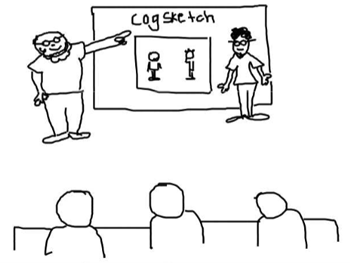 To be a participant in sketching, CogSketch must understand what you are drawing. One part of that is understanding the visual and spatial properties of the digital ink that you draw. Another part of that is having a conceptual understanding of what your ink is depicting, in real - world terms. CogSketch has, built into it, a powerful set of visual and spatial processing routines for encoding properties of what you draw in a human - like way. CogSketch also uses a large library of knowledge about the world, to provide its conceptual understanding of what you are drawing. It also has capabilities for analogical matching of sketches, so that it can compare sketches in a human - like way. However, it's important to remember that today's computers have far less knowledge and less computational power than people do. So CogSketch also needs more help from you than you might need to give a person you are sketching with. Sketching with CogSketch is not as fluent as sketching by yourself or with an other person, but there are ways of making it flexible enough that people find it useful. AI Research - interest in sketch understanding, spatial reasoning, or tasks that involve sketching. CogSketch can be used directly for a variety of computational experiments, by using the query and Knowledge Base extensions built into the software, and through the socket - based KQML interface. For example, ancestors of CogSketch were used as interfaces and reasoning components in integrated systems built by Cycorp, SRI, and the US Army Battle Command Battle Lab. Modeling Human Visual/Spatial Reasoning - CogSketch has been used in a variety of cognitive simulation experiments You can use CogSketch to provide an interface for sketching stimuli, extracting the data either via saved files or the socket - based KQML interface. Cognitive Science - sketching data lab/classroom experiments. CogSketch gathers detailed timing data, both at the level of individual ink strokes and at the level of glyphs. This greatly simplifies analyzing the order in which elements of a sketch are drawn. It can provide timing signals to support synchronizing it with other equipment, such as eye trackers. The grading rubrics in Sketch Worksheets can be used to help automatically score data. Education - using intelligent sketch - based educational software in the classroom. CogSketch is designed as a platform for intelligent sketch - based educational software. Sketch Worksheets are aimed at helping students learn about spatial layouts and configurations. They are like pencil and paper worksheets, except that they can provide immediate feedback. Design Coach is aimed at helping engineering design students learn to use sketching to communicate ideas. Students explain their designs by drawing a kind of comic strip, plus filling out a language - like form which describes aspects of a design that are difficult to draw. CogSketch can reason qualitatively about forces and surface contacts in 2D drawings, and this ability is used to provide feedback about the studentҳ explanation. Researchers at SILC are gathering a corpus of sketches using CogSketch. They are using it to explore how people reason and learn, and are exploring how to incorporate sketching into education, to improve student learning. By gathering people's sketches, scientists will be able to do analyses that will help them with both of these missions. If you want to participate, all you have to do is download CogSketch, and indicate your acceptance when you install the software. "Common Lisp remains one of the best languages for Artificial Intelligence applications, its flexibility enables rapid experimentation and deployment", said Professor Ken Forbus, Walter P. Murphy Professor of Computer Science at Northwestern University. "Today's Lisp compilers are robust and flexible allowing development entirely within Lisp or in combination with other languages. For example, our CyclePad system for helping engineering students learn thermodynamics is written entirely in Allegro CL. Similarly, CogSketch is primarily written in Allegro CL with two modules in C."
You can download CogSketch for free here. For additional informaiton on the CogSketch Project, see here. Ken Forbus, the project leader, is the Walter P. Murphy Professor of Computer Science and Professor of Education at Northwestern University. He is notable for his work in qualitative process theory, automated sketch understanding and on automated analogical reasoning. He developed the structure mapping engine based on the structure-mapping theory of Dedre Gentner. He is a Fellow of the Association for the Advancement of Artificial Intelligence. He is the Chair-elect of the Cognitive Science Society and became the chair (president) of the society in August, 2011.